SKU: SKU16209. Categories: All Manual Toothbrushes, Crest Manual Toothbrush. 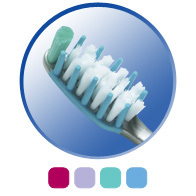 Crest Deep Clean toothbrushes feature Interslide technology, from Crest Glide floss, to reach up to 54% deeper between teeth than other manual toothbrushes. Look for them in four varieties to meet your specific brushing needs: ActiveClean, Whitening, Sensitivity and Gum Care.